The humid summer air is slowly turning into cool and crisp bursts of wind. Colorful flowers like impatiens and begonias are being replaced with yellow and orange mums. Yup, fall is here. As the countdown to summer resets, our list of things to do around house includes transitioning our house from summer to fall. For many of us that also means breaking out the Halloween decorations. If you want to show off your festive side but would prefer your home not to resemble that of Morticia Addams, then these tips are for you. Your steps are probably the easiest thing to decorate. If you want to go basic, you can buy a few pumpkins and you are all set. Want to take it a step further? Add a few lanterns for an elegant effect. Porches were made for Halloween decorations. OK maybe I am exaggerating, but they are the perfect spot for seasonal decor. Focus on one corner of your porch and pick one large item as your focal point. 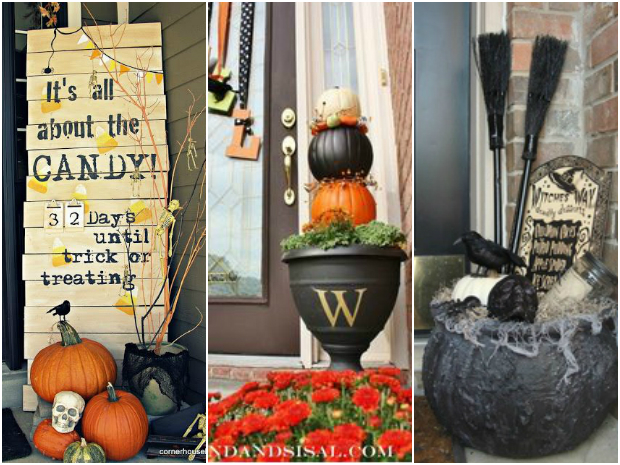 Some ideas to get you started: a cauldron, broomstick, pumpkin topiary or a hay bale. Mums are a fall classic that are an elegant addition for your curb appeal. 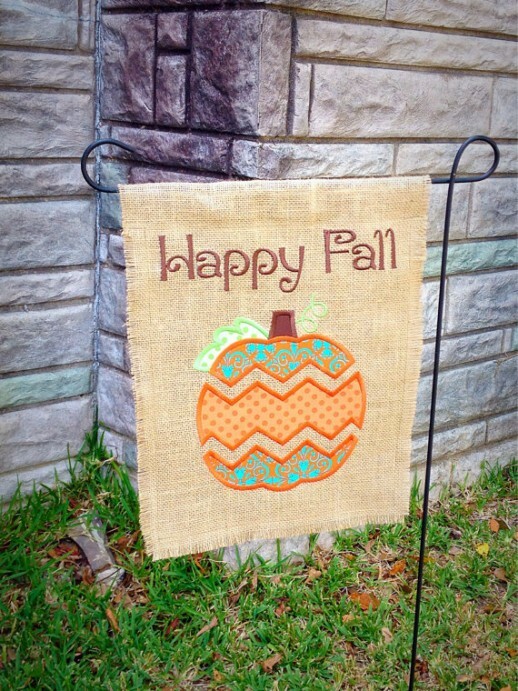 In addition to planting mums you can find other garden decorations like flags and signs on sites like Etsy and Amazon. 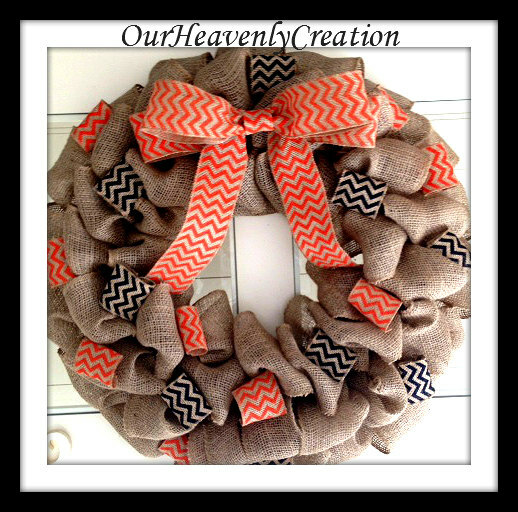 A simple wreath will tie the look together. You can make your own or buy one from Michaels or Etsy. Creating a frightening foyer is as easy as picking a theme. You can go with colors, like orange, black and/or purple, creatures like bats, skeletons or witches or just an overall Autumnal theme. This is the first, and sometimes only, thing guests will see when they enter so you can show off your Halloween spirit without even touching any other room in the house. 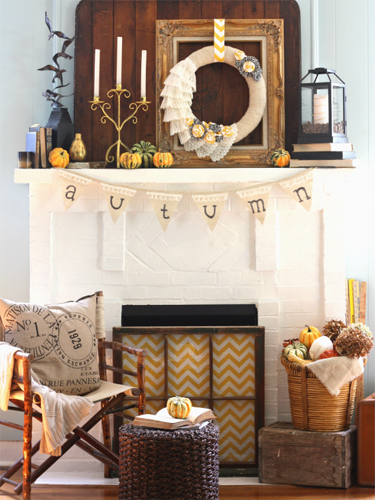 If you have a fireplace then you have prime real estate in your home for a Halloween display. 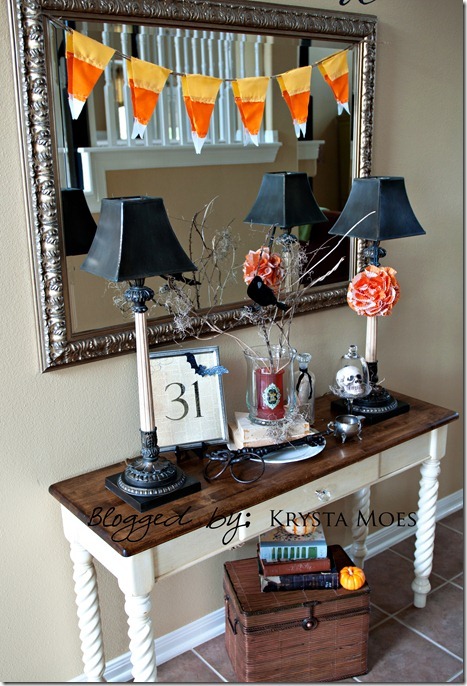 Candles, mini pumpkins and simple garland are affordable touches that go a long way. If you are looking for a house to buy or rent and then decorate, please call me at 914-215-2025. Or if you are tired of decorating your home every year and might want to downsize, please give me a call at 914-215-2025. Or if you really like to decorate and do not have enough space, please call me at 914-215-2025. BIG OR SMALL: WHICH SIZE HOME IS BEST FOR YOU? This can be a tricky question to answer. Partly because our needs change over the years and decades. After kids leave home, maybe smaller is better but prior to that, maybe a bigger home is what you’re seeking–room for the kids, dog, and tons of the kids’ sleepover friends. The trends reflect our indecisiveness too. Sometimes McMansions are on the rise and then there’s the complete opposite: tiny, tiny homes. In fact, you can watch fascinating shows online about families of four with a couple of dogs moving into these tiny well-designed homes or homes on wheels. While that small may be far too small, size is a big consideration. It’s also something you should think about before you go house-hunting for that perfect home. Of course,while there are many personal reasons involved in choosing which size home is the best fit, there are also some very important considerations that can help you decide. Here are few things to help you weigh your options. The bigger the home, usually the higher the mortgage. You pay for what you get. It’s likely the mortgage payments will be more. However, a smaller home with more amenities is sometimes not that far off in price from a larger home that gives you a bit more square footage. Think about if you are planning to stay in the home a long time. If so, getting a bit more square footage now might be better than having to move again in a short period of time when you may outgrow the home. Decide how much home you’re willing to maintain. For instance, do you want the responsibility of a big back yard or do you want to have something in a planned development, such as a town home, where there is limited yard space to decorate and maintain. That reduced yard size can give you a lot more freedom and leave you with more money in your bank account as opposed to paying for landscaping maintenance. If you want a bigger home but aren’t sure you can afford it, consider your options. Can you get a roommate? Increase your income? Decrease your debt? Or maybe you can wait a little bit longer and save more to get into the home you really want. The important thing is to think about the size and style of home you want before you start your house-hunting. This will help you target homes that are most suitable for your needs. Be sure to consult with experts to get the best advice and find out how much home you can really afford. On a day chock full of World Premieres here in Telluride, The Weinstein Company which has used this festival for North American launches of The King’s Speech and The Artist, and saw both go on to win Best Picture Oscars, just might be on to another major Best Picture contender after its first public screening of the Alan Turing biopic, The Imitation Game. Of course it is easy this time of year to go into just about every film that hits the Fall Festival circuit as a potential awards player after a large drought of Oscar- quality films for the first eight months of the year, but this one just has Academy Award nominations written all over it. Not just in the Best Picture race where a slot seems likely, but also directing for Norwegian helmer Morten Tyldum (Headhunters), debuting screenwriter Graham Moore, and certainly the stunning lead actor performance of new Emmy winner Benedict Cumberbatch as Turing, the brilliant British math nerd who cracked the code of Nazi Germany’s military maneuvers , but also led a complex, and ultimately tragic, personal life. Also sure to get strong consideration is Keira Knightley, as good as she has ever been, as a colleague of Turing who becomes so much more. Although she has lead billing with Cumberbatch, producers tell me they plan to put her in Supporting Actress and that seems appropriate unless the actors branch who votes on these things disagrees, but the thrust of the film is really Cumberbatch. Tyldum said he is not particularly a fan of period films, but the theme of the importance of not following the norm and being different really won him over in taking on this project. Also drawn to the film was Harvey Weinstein who picked it up after seeing just 15-minutes of footage. “It was good to have someone coming in at that process and to push us to do a little bit more because we have lived with this story for so long,” said Ostrowsky. Weinstein came to Telluride for the premiere, but when I asked him afterwards about it, he really deferred to the filmmakers praising their work. He’s obviously high on this one’s Oscar prospects and also told me he expects big things in the awards season from the December release of Tim Burton’s Big Eyes which stars Amy Adams and Christoph Waltz. The Imitation Game opens November 21st. This is a significant date for Weinstein as both King’s Speech and The Artist opened the same week in 2010 and 2011 respectively. Since both won Best Picture it looks like a good luck date for The Weinstein Company. I would be surprised if this one doesn’t firmly put them in the 2014 race. At any rate Tyldum is happy with the Telluride debut. “It’s now off. It’s not our film anymore. Now anyone who’s seen it and talks about it, it’s their film,” he said. Moore added that he hopes people take from it a portrait of a completely singular and unique man. ” He was treated very badly and his life ended very sadly, but he deserves to be celebrated,” he said. WASHINGTON — Sales of existing homes in the United States rose in July to a 10-month high, and the number of Americans filing new claims for unemployment benefits fell last week, signaling strength in the economy early in the third quarter. The growth outlook was further buoyed by other reports on Thursday showing that in August, factory activity in the mid-Atlantic region hit its highest level since March 2011 while a gauge of future economic activity increased solidly last month. “The economy is beginning to fire on more cylinders,” said Ryan Sweet, a senior economist at Moody’s Analytic in West Chester, Pa. The National Association of Realtors said existing-home sales increased 2.4 percent, to an annual rate of 5.15 million units. That was the highest reading since September and confounded economists’ expectations for a pullback. It was the fourth consecutive monthly gain in sales, confounding economists, who had expected a decline. In a further encouraging sign, the share of first-time buyers rose for a second consecutive month and more houses came onto the market, which should temper price increases. Earlier stages of the housing recovery were driven by investors. Housing activity stagnated in the second half of 2013, weighed down by a run-up in mortgage rates and home prices, but it now appears to be regaining its footing. A report on Tuesday showed a surge in home construction in July. “We are moving back to a more normal market where it’s driven by the fundamentals of confidence in the economy,” said Budge Huskey, chief executive of Coldwell Banker Real Estate in Madison, N.J. In a separate report, the Labor Department said initial claims for state unemployment benefits fell 14,000 to a seasonally adjusted 298,000 for the week ended Aug. 16. That pointed to a sustained improvement in labor market conditions. The four-week average of claims, considered a better measure of labor market trends as it irons out week-to-week volatility, rose 4,750, to 300,750. At that level, it is consistent with solid job growth, and claims are back to prerecession levels. The jobless claims report covered the period during which the government surveyed employers for August’s nonfarm payrolls data. The four-week average of claims fell 8,500 between the July and August survey periods, suggesting another month of relatively strong job gains. Nonfarm payrolls increased by 209,000 in July, marking the sixth consecutive month that job growth topped 200,000, a sign of strength last seen in 1997. The firming jobs picture has caught Federal Reserve officials by surprise. Minutes of the Fed’s July policy meeting published on Wednesday showed that officials viewed the improvement in labor market conditions as “greater than anticipated” and hinted that it could lead to an early interest rate increase. In a third report, the financial data firm Markit said its preliminary manufacturing purchasing managers index for the United States rose to 58 this month, the highest point since April 2010, from 55.8 in July. That show of strength was corroborated by a separate report from the Philadelphia Federal Reserve Bank, which showed that its business activity index increased to 28.0 this month, the highest point since March 2011, from 23.9 in July. Any reading above zero indicates expansion in the region’s manufacturing. “Over all, today’s Philly Fed and Markit manufacturing surveys indicate continued healthy growth in the manufacturing sector in August,” said Dean Maki, chief United States economist at Barclays in New York.